Chatan (Chosson) Outfits, Jewish Bride Dresses, Jewish Mother of the Bride Dresses Bar Mitzvah Attire, Bar Mitzvah Clothes, Israeli T-shirts, Israeli fashions and more. Shabbat Attire: Dressing Up for the Holy Day! Just as you will find in every Jewish observant household a double set of dishes and pots - the one designated for use for dairy products, the other for meat and poultry, so will most observant Jewish households, poor and rich, sport two wardrobes - the one for everyday use, the other for Shabbat and Holidays. Growing up, I remember the semi-annual event of buying shoes. At the eve of every Pesach (Passover) and Rosh Hashannah, new shoes were purchased. The new pair would be designated as the "New Shabbat Shoes" and the six month old pair purchased would be demoted to everyday use. The third pair which until now worn daily was thrown away or given to charity if still in decent shape. Observant Jews are an eclectic people, and of course it is misleading to lumped into one group. 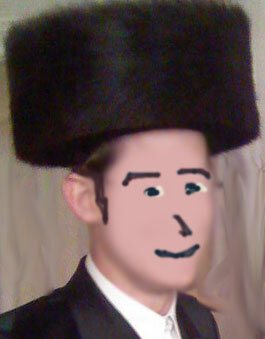 Differences are conspicuous when observing the Shabbat attire of orthodox Jews. Many Chassidic men wear special hats (Shtreimel) and coats on Shabbat. The men in modern orthodox community in Israel on the other hand, are often clad in white Shabbat shirts and either black or khaki pants. Amongst the "Black Hat" yeshiva crowd, the differences are more subtle. Only the ones with a real keen eye and an understanding of the culture can see the difference between the Shabbat and everyday hat or suit. 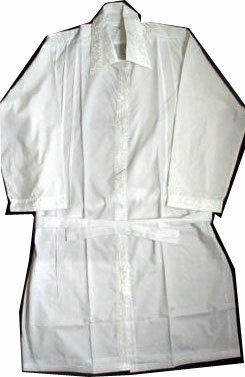 Chassidic women in especially of Hungarian decent may often be seen wearing a white apron on Shabbat, while the modern orthodox may avoid wearing sneakers and other sport wear (Jeans and the like) and adorn more formal attire. Broadly generalizing, the delineation between Shabbat and Daily wardrobes are more pronounced in communities that are to the center or right of center religiously speaking. A Chassidic young or old man will never be caught wearing sandals on Shabbat, while a modern orthodox males are way more lax. 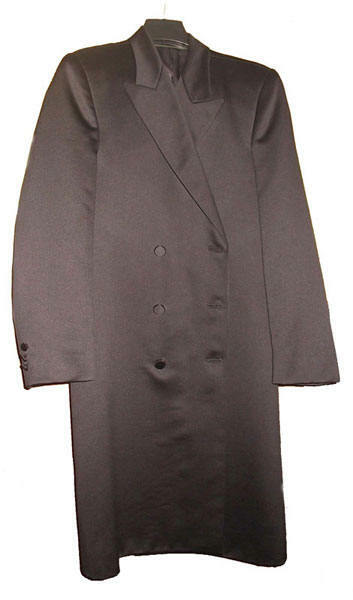 Bekishe: A bekishe is a long black silk (or for those seeking more affordable - polyester) coat worn by Chasidic Jews. Mostly the bekishe is worn on Shabbat, Jewish holidays and for Jewish celebrations such as weddings and bar mitzvahs. Gartel: Yiddish for "belt." The gartel is generally used by Chassidic men, though sometimes by other orthodox men, during prayer. Kippah: The kippah (Hebrew plural: Kippot) is traditionally worn by orthodox boys and men. In modern times, some women, mainly affiliated with the Reform and Consevative movements, wear a kippah. While some Jews wear kippot only while praying, eating, reciting a blessing, or studying Jewish religious texts, most orthodox males cover wear the kippah at all times. There is a myriad of styles for Kippot, including the Knitted (crocheted) Kippot worn primarily by Modern Orthodox Jews, Suede Kippot worn by the modern and Yeshivish crowds, Velvet Kippot worn by children of the main stream orthodox, Women's Kippot, and Specialty Kippot among others. For Celebrations, Imprinted Kippot commemorating the occasion are sometimes distributed to Jewish Weddings, Bar and Bat Mitzvah guests. 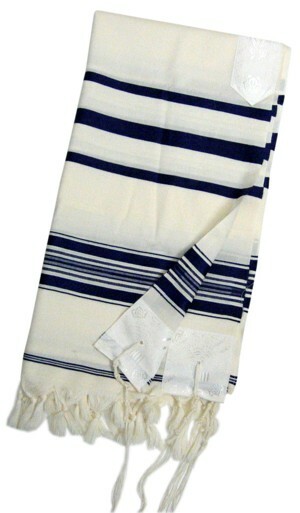 Kittel: The kittel, Yiddish for robe, is a white garmet worn by mainly orthodox male Jews on special occasions such as one's wedding day, during the Rosh Hashanah and Yom Kippur prayer services, and during the passover Seder. 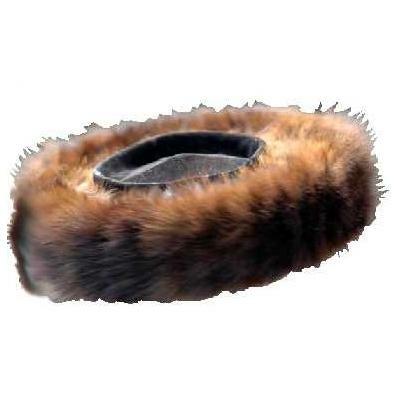 Spodik: A spodik is a tall fur hat worn similar to the Shtreimel but distictly different in its size and height. The Spodik is worn by specific mail Chasidic sect members usually of Polish decent. The Ger Chassidus is most famous for this particular head gear. Tallit: The tallit (טַלִּית) also called tallis is a prayer shawl worn during the Shacharit morning prayers by married Jewish men. 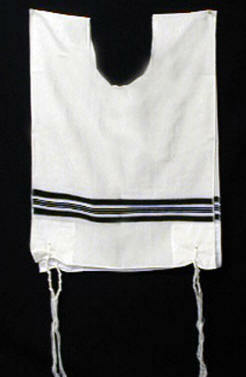 Men wear the tallit also during the Torah reading services and Shabbat and other holidays. It has special twined and knotted fringes known as tzitzit attached to its four corners. Tichel: The Tichel is a headscarf worn by some Orthodox Jewish women in compliance with the code of "tzniut" modest attire. The word "Tichel" is Yiddish for "kerchief." 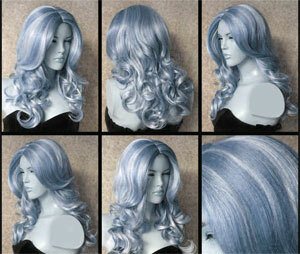 There are lots of styles for Tichels, from very plain to extremely elaborate designs and fabrics. How to Dress Jewish Every Day? Jewish T-Shirts, Jewish Attire fitting for the Synagogue, Jewish School Clothes, Modest attire for Jewish Women, Israeli Apparel, Israel related T-Shirts, Shabbat Shoes, Jewish Wedding Shoes. How to Dress for a Jewish Wedding? Is a Tuxedo the standard? What about the Mother of the Jewish bride? What do the Jewish Bridesmaids wear? What are Jewish Wedding Clothes appropriate for Jewish Children? How to dress for a Bar Mitzvah? Is a Tuxedo the standard? What about the Mother of the Bar Mitzvah or Bat Mitzvah? What are appropriate Bar Mitzvah or Bat Mitzvah Clothes for Jewish Children? How to dress for a Jewish Funeral? Appropriate attire for Jewish Funerals. Shall one wear black?